1Bruce Ackerman is Sterling Professor of Law and Political Science at Yale. His major works include Social Justice in the Liberal State and his multivolume constitutional history, We the People. His most recent books are The Decline and Fall of the American Republic (2010), The Failure of the Founding Fathers (2005), and Before the Next Attack (2006). His book, The Stakeholder Society (with A. Alstott), served as a basis for Tony Blair’s introduction of child investment accounts in the United Kingdom. Bruce Ackerman is a member of the American Law Institute and the American Academy of Arts and Sciences. He is a Commander of the French Order of Merit, and the recipient of the American Philosophical Society’s Henry Phillips Prize for Lifetime Achievement in Jurisprudence. 2Anne Alstott is a professor of law at the Yale Law School. She is the author of numerous articles on social policy and the family, including 'Is the Family At Odds With Equality? The Legal Implications of Equality for Children', S. Cal. L. Rev. (2008); 'Private Tragedies? Family Law As Social Insurance', Harv. L. & Pol’y Rev. (2010); and 'Family Values, Inheritance Law, and Inheritance Taxation', Tax L. Rev. (2009). She is also the author of two books: No Exit: What Parents Owe Their Children and What Society Owes Parents (Oxford U. P., 2004), and (with B. Ackerman) and The Stakeholder Society (Yale U. P., 1999). 3Christian Arnsperger (Ph.D. and agrégation in economics) is Senior Research Fellow with the Belgian National Science Foundation (F.R.S.-FNRS). He is also a Professor of economics at the Université catholique de Louvain (UCL), teaching in both the economics and the sociology department, and a permanent member of the Hoover Chair. His research deals with issues of complexity theory applied to social science, sustainable economic systems, the transition toward alternative modes of production, monetary circulation and consumption, and the existential underpinnings of markets and competition. His books include Critical Political Economy and Full-Spectrum Economics (Routledge, respectively in 2008 and 2010) and Ethique de l'existence post-capitaliste (Cerf, 2009). 4Catherine Audard is a Visiting Fellow at the Department of Philosophy of the London School of Economics and Political Science. She is the Chair and co-founder of the Forum for European Philosophy. Her main interests rest with moral and political philosophy, theories of justice, utilitarianism, liberalism and the critique of multiculturalism. Her most recent books include John Rawls, (Acumen, 2007) and Qu’est-ce que le libéralisme? (Gallimard, 2009). 5John Baker is an Associate Professor of Equality Studies at University College Dublin. He is co-founder of the UCD Equality Studies Centre (1990) and of the UCD School of Social Justice (2005). He is the author of Arguing for Equality (Verso, 1987) and co-author of Equality: From Theory to Action (Palgrave, 2009, 2nd edn.) and of Affective Equality: Love, Care and Injustice (Palgrave, 2009). His main area of research is theoretical issues in equality studies. 6Eran Bendavid is an infectious diseases physician and an assistant professor of medicine at Stanford University. His work explores the economic and political conditions that promote health improvements in developing countries. His latest writings evaluate the World Health Organization’s approach to treatment of HIV, and how the Global Gag Rule affected women’s reproductive choices in Africa. With the M-Maji group at Stanford, he explores how innovation and technological design can leapfrog institutional malaise in delivering clean water and increasing agency. 7François Blais is a political philosopher at the Political Science Dept. of Laval University (Québec city). He is the author of Ending Poverty. A Basic Income for All Canadians (Lorimer, 2002), and of several articles on related issues. He remains a strong advocate of basic income, and has delivered many conferences in order to promote this idea. Since 2006, he is the Dean of the Faculty of Social Sciences at Laval University, where he continues to teach the history of political thought. 8Paul-Marie Boulanger is an independent social scientist with degrees in sociology (Strasbourg & Louvain). He has been active in the fields of sustainable development, demography and social security (in developed countries), as well as food security and famine prevention in Africa. Regarding the latter, he supervised and designed the methodology of the Early Warning Systems (SAP) of famines in Mali, Chad, Mozambique and Madagascar. He heads the IDD (Belgium), a research institute that focuses on sustainability and well-being indicators, sustainable consumption, transition management, energy efficiency, etc. As a member of the Collectif Charles Fourier, he has been heavily involved together with Ph. Van Parijs in conceptualizing, analyzing and disseminating the idea of basic income. 9Samuel Bowles (PhD, Economics, Harvard) is Research Professor at the Santa Fe Institute where he heads the Behavioral Sciences Program. He recently published (with Herbert Gintis) A Cooperative Species: Human reciprocity and its evolution (Princeton U.P., 2011). His next book is Machiavelli’s Mistake: Why good laws are no substitute for good citizens. He has also been a high school teacher in Nigeria and an economic advisor to the governments of Cuba and Greece, to presidential candidates Robert F. Kennedy and Jesse Jackson and to President Nelson Mandela. 10Harry Brighouse is Professor of Philosophy and Affiliate Professor of Education Policy Studies at the University of Wisconsin, Madison, and codirector of the Spencer Foundation’s Initiative on Philosophy in Educational Policy and Practice. He is author of School Choice and Social Justice (Oxford U.P., 2000), Justice (Polity, 2004) and On Education (Routledge 2005), and is a contributor to http://www.crookedtimber.org. He is currently working, with Adam Swift on a book called Family Values. 11Bea Cantillon is Professor of Social Policy and director of the Herman Deleeck Centre for Social Policy (University of Antwerp, Belgium). She has published extensively and internationally on a wide range of subjects: poverty, social policy, social security, the welfare state and gender. She has acted as a consultant to, among others, the OECD, the European Commission and the Belgian government. Next to being the chair of the National Administration for Family Allowances (ONAFTS), she also served as a Belgian Senator (1995-1999) and was president of the National Reform Commission on the Belgian Social Security for independent workers (2000-2002). 12Ian Carter is Associate Professor of Political Philosophy at the University of Pavia, Italy. He is the author of A Measure of Freedom (Oxford U. P., 1999) and La libertà eguale (Feltrinelli, 2005). He recently edited Freedom: a Philosophical Anthology (Blackwell, 2007, with M. Kramer & H. Steiner) and Hillel Steiner and the Anatomy of Justice (Routledge, 2009, with St. de Wijze & M. Kramer). He is a member of the editorial boards of Economics & Philosophy and J. of Applied Philosophy. 13Paula Casal is an ICREA Research Professor at Pompeu Fabra University (Barcelona). She was previously a Reader in Moral and Political Philosophy at Reading University (2003-2011) and a Lecturer at Keele University (1996­2004). She was also a Fellow in Ethics (Harvard, 1999-2000), a Keele Junior Research Fellow (Harvard, 2000-1), a Hoover Fellow (Louvain, 2001-02), and a Leverhulme Research Fellow (Oxford, 2002-3). She is interested in social and global distributive justice, environmental taxation, multiculturalism, gender and animal ethics. Her work has appeared in such journals as Ethics, J. of Political Philos., and J. of Moral Philos.. She is an Associate Editor of Politics, Philosophy & Economics, and a founding member, and President, of the Great Ape Project-Spain. 14Jean-Michel Chaumont (PhDs in philosophy and sociology) is a permanent research fellow at the FNRS and a member of the Hoover Chair (UCL). His publications include La concurrence des victimes. Génocide, identité, reconnaissance (Découverte, 1997) and Le mythe de la traite des blanches. Enquête sur la fabrication d’un fléau (Découverte, 2009), both forthcoming in English with Temple U.P. He co-edited with Ph. Van Parijs Les limites de l’inéluctable : penser la liberté au seuil du troisième millénaire (De Boeck, 1991). 15Denis Clerc is an economist, founder and former director (until 2000) of the coop that publishes the monthly magazine Alternatives économiques. He is an expert in poverty issues and a former member of the French Council for Employment, Income and Social Cohesion, a public body that was headed by former President of the EU-Commission Jacques Delors. His books include Déchiffrer l’économie (Découverte, having now reached its 17th edition), La France des travailleurs pauvres (Alternatives économiques, 2009) and La paupérisation des Français (A. Colin, 2010). 16Joshua Cohen is Marta Sutton Weeks Professor of Ethics in Society, and professor of political science, philosophy, and law at Stanford University. He is author, most recently, of The Arc of the Moral Universe and Other Essays (Harvard U.P., 2011). He is also editor-in-chief of Boston Review, on the faculty of Apple University, and, with Ph. van Parijs as well as some other contributors to this volume, a member of the September Group. 17Laurent de Briey (PhD in philosophy, Louvain & MA in Economics) is Assistant Professor at the University of Namur (FUNDP). His research focuses especially on moral and political philosophy. He has notably published Le conflit des paradigmes (ULB, 2006) and Le sens du politique (Mardaga, 2009). He is also director of Cepess (the research centre of the Belgian political party CDH), actively involved in the current negotiations aimed at reforming Belgian fiscal federalism. 18Paul De Grauwe (Ph.D, Johns Hopkins) is professor of international economics at the University of Leuven (KULeuven, Belgium) and holds honorary doctorates from the universities of S. Gallen (Switzerland), Turku (Finland), and Genoa (Italy). He was a member of the Belgian parliament from 1991 to 2003. He is a research fellow at the Centre for European Policy Studies in Brussels. His research interests are international monetary relations, monetary integration, theory and empirical analysis of the foreign-exchange markets, and open-economy macroeconomics. His books include The Economics of Monetary Union (Oxford), International Money. Post-war Trends and Theories (Oxford), and The exchange rate in a behavioural finance framework (Princeton). He collaborated with Philippe Van Parijs in setting up the "Rethinking Belgium" inititative. 19Kris Deschouwer is research professor and head of the department of political science at the Vrije Universiteit Brussel (VUB). His research focuses on processes of political participation and representation, with specific focus on how to govern divided societies. His latest book is The Politics of Belgium. Govering a Divided Society (Macmillan Palgrave, 2009). He coordinates -with Philippe Van Parijs - the Pavia Group that defends a statewide constituency for the Belgian federal elections. 20Helder De Schutter is an Assistant Professor in Social and Political Philosophy at the Katholieke Universiteit Leuven (KUL, Belgium). He has research interests in contemporary political philosophy, in eighteenth­century French and German political thought, and in continental theories of language. His recent work focuses on normative justifications of nationalism, language policy and federalism. Recent publications have appeared in Politics, Philosophy & Economics; J. of Political Philos. ; Inquiry; J. of Applied Philos. and Metaphilosophy. 21Jacques H. Drèze was born in 1929. He is married to Monique, they have five sons, and they have sailed around the world together. Jacques holds a PhD from Columbia, and 17 Honorary Doctorates. Until 1989, he taught econometrics and mathematical economics at UCLouvain, where he supervised 20 dissertations and served as Research Director, then President of CORE, of which he is still an active member. He was visiting professor at Carnegie, Northwestern, Chicago and Cornell. He was President of The Econometric Society, the European Economic Association and the International Economic Association. He has authored/edited 8 books and published some 150 refereed papers with over 60 co-authors. 22Jon Elster is the Robert K. Merton Professor of Social Science at Columbia University (New York). His books include Ulysses and the Sirens (rev. ed 1984), Sour Grapes (1983), Making Sense of Marx (1985), Alchemies of the Mind (1999) and Explaining Social Behavior (2007). He is currently working on the normative analysis of collective decision-making and on the interaction of arguing, bargaining and voting at the Federal Convention (1787) and the French Assemblée Constituante (1789-1789). 23Marc Fleurbaey is Laurance S. Rockefeller Professor of Public Affairs (Princeton), after having been successively an economist at INSEE, a professor of economics at the Universities of Cergy-Pontoise and Pau (France), and a Research Director at the CNRS (Paris-V). He is a former editor Economics & Philosophy and a managing editor of Social Choice and Welfare. He is the author of Fairness, Responsibility, and Welfare (Oxford U.P., 2008), a co-author of A Theory of Fairness and Social Welfare (Cambridge U. P., 2011, with F. Maniquet), and the co-editor of several books, including Justice, Political Liberalism, and Utilitarianism: Themes from Harsanyi and Rawls (Cambridge U. P., 2008, with M. Salles & J. Weymark,). His research focuses in particular on the analysis of equality of opportunity and responsibility­sensitive egalitarianism and on seeking solutions to famous impossibilities of social choice theory. 24Robert E. Goodin is Distinguished Professor of Social & Political Theory (School of Philosophy, Australian National University) and Professor of Government (Essex). He is Founding Editor of the Journal of Political Philosophy, founding Editor of the Cambridge University Press series of books on 'Theories of Institutional Design' and General Editor of the eleven-volume Oxford Handbooks of Political Science. He is author of Innovating Democracy (Oxford U.P., 2008) and On Settling (Princeton U.P., forthcoming). 25Axel Gosseries is a philosopher (PhD, Louvain) and law scholar (LL.M., SOAS). A permanent research fellow of the FNRS and a Professor at Louvain University (UCL), his work focuses especially on theories of intergenerational justice and on the political philosophy of firms. He is the author of Penser la justice entre les générations (Aubier, 2004) and of articles in journals such as J. of Political Philos. ; Politics, Philosophy & Economics ; NYU Environmental Law J. ; International Economic Review and Economics & Philos. He co-edited one book on intellectual property (Palgrave, 2008) and another one entitled Intergenerational Justice (Oxford U.P., 2009, with L. Meyer). 26Katherine Hoffmann is a Policy Associate with the Safe Water Program at Innovations for Poverty Action (IPA) where she works on clean water issues with a focus on Western Kenya. She holds a B.A in International Relations and Economics and an M.A. in International Policy Studies from Stanford. 27Sangick Jeon is the M-Maji project lead, and a Ph.D. student in Political Science at Stanford University, where he is completing a dissertation project that explores strategies for supporting interethnic cooperation and realizing the productivity gains from diversity (e.g., in problem-solving and innovation). 28Warren A. Johnson (Ph.D. in resource planning and conservation, Michigan) is Professor Emeritus at the geography department of San Diego State University, where he has taught classes in world regional geography, natural resources, human ecology, and energy. His research interests cover, in addition, cultural geography as well as the overarching question of the kind of social and economic logic that is needed if the world economy is to become sustainable. His books include Economic Growth versus the Environment (Wadsworth, 1971), Muddling Toward Frugality (Easton Studio Press, 2010, 2d edn. ), and The Gift of Peaceful Genes (Easton Studio Press, 2011). 29Bill Jordan worked in the UK public services for 20 years. He has held academic posts in the Netherlands, Denmark, Germany, Slovakia, Hungary and the Czech Republic, and is currently Professor of Social Policy at the University of Plymouth. He is the author of some 27 books on social and political theory, social work and social policy. His most recent book is Why the Third Way failed. Economics, morality and the origins of the 'Big Society' (Policy Press, 2010). 30Justine Lacroix is Professor in the Department of Politics at the Université libre de Bruxelles and an Associate Professor at Sciences-Po Paris. She recently co-edited European Stories. How Intellectuals Debate Europe in their National Contexts (Oxford U.P., 2010, with K. Nicolaïdis) and is the author of La pensée française à l’épreuve de l’Europe (Grasset, 2008), L’Europe en procès (Cerf, 2004), Communautarisme versus libéralisme (ULB, 2003) and Michaël Walzer. Le pluralisme et l’universalisme (Michalon, 2001). In 2010, she was awarded an ERC Starting Grant for her project Human Rights versus Democracy? Towards a Conceptual Genealogy of Skepticism about Human Rights in Contemporary Political Thought (RESIST). 31Claus Offe was (until his retirement in 2005) Professor of Political Science at Humboldt University (Berlin). Since 2006 he teaches at the Hertie School of Governance where he holds a chair of Political Sociology. His fields of research include democratic theory, transition studies, EU integration, and welfare state and labor market studies. Books in English include Varieties of Transition (MIT, 1996) and Reflections on America. Tocqueville, Weber, and Adorno in the United States (Polity, 2005). 32Ingrid Robeyns is an economist and philosopher, and obtained her PhD at Cambridge under the supervision of Amartya Sen. She currently holds the Chair in practical philosophy at the Erasmus University (Rotterdam). She has published on a wide range of issues within normative political philosophy, including theories of justice; care, children, gender and parenthood; alternative economic systems; and global ethics. She has also published widely on the capability approach – both foundational as well as applied work. 33John E. Roemer is the Elizabeth S. and A. Varick Stout Professor of Political Science and Economics at Yale University. His current work concerns distributive justice, political economy, and the relationship between them. Recent books are Racism, Xenophobia, and Redistribution (Harvard U.P., 2007), Democracy, education and equality (Cambridge U.P., 2006), Political Competition (Harvard U.P., 2001), Equality of Opportunity (Harvard U.P., 1998), Theories of distributive justice (Harvard U.P., 1996), and A future for socialism (Harvard U.P., 1994). His current interests include distributive justice in the presence of global warming. He is a fellow of the Econometric Society, the American Academy of Arts and Sciences, a corresponding fellow of the British Academy, and a past fellow of the Guggenheim and Russell Sage Foundations. 34Erik Schokkaert is professor of welfare economics at the Department of Economics of the KULeuven, and currently Research Director of CORE (UCLouvain). He chairs the interdisciplinary think tank ”Metaforum” at the K.U.Leuven. His research focuses on (a) the modelling of different concepts of distributive justice; (b) the empirical analysis of opinions about justice in the population; (c) the application of these theories to policy problems in the fields of health, social security and taxation. 35Dave Sinardet is Professor of political science at the Free University of Brussels (VUB) and the University of Antwerp. He lectures at the Facultés Universitaires Saint-Louis. He is specialised in federalism, nationalism, political communication, multilingual democracy and Belgian politics. His PhD thesis dealt with the role of media in the Belgian federal system and the mutual representation of both language communities. He is also a columnist for De Standaard and Le Soir and an active contributor to the Belgian public debate on federalism and institutional reform. 36Hillel Steiner is a Fellow of the British Academy, Emeritus Professor of Political Philosophy in the University of Manchester, Professor of Political Philosophy in the University of Salford, and Research Fellow in the Justitia Amplificata Centre for Advanced Studies (Frankfurt). He is the author of An Essay on Rights (Blackwell, 1994) and co-author of A Debate Over Rights: Philosophical Enquiries (Oxford U. P., 1998, with M. Kramer & N. Simmonds). His current research projects include ones on the concept of ‘the just price’ and the application of libertarian principles to global, and to genetic, inequalities. 37Nenad Stojanovic (PhD in Political Science, Zurich) is a Senior Research Fellow at the Centre for Democracy Studies in Aarau (ZDA), and a Lecturer at the universities of Zurich and Lausanne. His articles have appeared in journals such as Representation, Swiss Political Science Review, International J. on Multicultural Societies, Nations and Nationalism, Politique & Sociétés and Ratio Juris. 38Eduardo Matarazzo Suplicy (PhD in Economics, Michigan) started his career as a lecturer in economics (São Paulo). In 1978, he was elected State Representative at the State Assembly of São Paulo. One of the founders of the Worker’s Party (PT) he became one of its Federal Representatives in 1982. In 1988, he was elected City Councilman and President of the City Council of São Paulo. Since 1990, he got elected three consecutive times (for 8 year terms) as Senator representing the State of São Paulo and the Workers' Party. In this capacity, he was able to get passed the Act instituting a Citizen's Basic Income, to become one day unconditional. His main book is Renda de Cidadania. A Saída é pela Porta (Fundação Perseu Abramo/Cortez Ed., 6th ed. in 2010). 39Adam Swift is Fellow in Politics and Sociology at Balliol College, and a member of the Centre for the Study of Social Justice (Oxford). He is co­author of Liberals and Communitarians (Blackwell, 1996, 2nd ed.) and Against the Odds? Social Class and Social Justice in Industrial Societies (Oxford U. P., 1997) and author of How Not To Be A Hypocrite: School Choice for the Morally Perplexed Parent (Routledge, 2003) and Political Philosophy: A Beginners’ Guide for Students and Politicians (Polity, 2006, 2nd ed.). He is currently working, with H. Brighouse, on a book called Family Values. 40Luc Van Campenhoudt (PhD in sociology, Louvain) is a professor at Facultés universitaires Saint-Louis (Brussels) and guest professor at the university of Louvain. His current work focuses on the methodology of social sciences, especially on the group analysis method, and on power in agency networks (networks of social agents). He has written a number of books and articles, including his handbook Manuel de recherche en sciences sociales (Dunod, 4th ed., with R. Quivy), used by hundreds of thousands of students in more than thirty countries. 41Robert van der Veen teaches political theory at the University of Amsterdam and is a member of the Amsterdam Institute of Social Science Research. His recent publications include ‘Post-productivism and welfare states: a comparative analysis’, British J. of Political Science, 2006, with L. Groot; Sustainable Quality of Life: conceptual analysis for a policy-relevant empirical specification (Report for the Netherlands Environmental Assessment Agency, 2007, with I. Robeyns), 'Reasonable partiality for compatriots and the global responsibility gap', CRISPP, 2008. 42Wim Van Lancker studied Political & Social Sciences (Ghent) and is a doctoral researcher at the H. Deleeck Centre for Social Policy (Antwerp, Belgium). His current research focuses on comparative social policy, with a focus on the impact of family policy on the redistributive capacity of welfare states and female labour market participation. He has published nationally and internationally on basic income, poverty, employment issues, social Europe, and family policy. 43Yannick Vanderborght teaches political science at the Facultés universitaires Saint-Louis (Brussels), where he currently directs the Research Centre in Political Science (CReSPo). He is also a member of the Hoover Chair (Louvain), of the Executive Committee of the Basic Income Earth Network (BIEN), and an associate editor of Basic Income Studies. He co­authored with Ph. Van Parijs L'allocation universelle (2005), and has published several articles on basic income and related issues. He is the co-editor (with K. Widerquist, J. Noguera, and J. De Wispelaere) of Basic Income: an Anthology of Contemporary Research (Blackwell, forthcoming). 44Nicholas Vrousalis read Economics at Cambridge, UK and completed his doctorate in political philosophy at Oxford in 2009. Since then, he has been postdoctoral fellow at the Chaire Hoover, Université catholique de Louvain. His research interests are in political philosophy and Marxism and his work has appeared in Social Theory and Practice, Res Publica and the Journal of Ethics. 45Daniel Weinstock holds the Canada Research Chair in Ethics and Political Philosophy (Philosophy Dept., Université de Montréal). He is also the Founding Director of the Centre de recherche en éthique de l'Université de Montréal (CréUM). His work has spanned broadly across the contemporary moral and political philosophy. He has written extensively on the question of the just management of diversity in liberal democracies. A native Montrealer, he has held a number of public appointments. In particular, he was a member of the Commission chaired by Charles Taylor and Gérard Bouchard looking into the issue of "reasonable cultural accommodation" in Québec. He was also the Founding Chair of Quebec's Public Health Ethics Committee. 46Karl Widerquist (PhD in Economics, CUNY & PhD in Political Theory, Oxford) is a Visiting Associate Professor in political philosophy at the Georgetown University School of Foreign Service in Qatar. He co-authored Economics for Social Workers (Columbia U. P., 2002, with M. A. Lewis), co-edited The Ethics and Economics of the Basic Income Guarantee (Ashgate, 2005, with M. A. Lewis & St. Pressman), and Basic Income: An Anthology of Contemporary Research (Blackwell, forthcoming). A founding editor of Basic Income Studies, he has published scholarly articles on economics, politics, and philosophy in such journals as Political Studies, Utilitas, Eastern Economic J., Politics & Society, and Politics, Philosophy & Economics. 47Andrew Williams is ICREA Research Professor in the Department of Law at Pompeu Fabra University (Barcelona), and Professor of Philosophy at the University of Warwick. His papers have appeared in journals such as Economics & Philosophy, Ethics, and Philosophy & Public Affairs. He co-edited The Ideal of Equality (Palgrave, 2002, with M. Clayton), Real Libertarianism Assessed (Palgrave, 2003, with A. Reeve), and Social Justice (Blackwell, 2004, with M. Clayton). He is also an Associate Editor of Politics, Philosophy & Economics. 48Terry Winograd is Professor of Computer Science at Stanford University, where he co-directs the Human-Computer Interaction program and the Liberation Technologies program. He is a founding faculty member of the Hasso Plattner Institute of Design (d.school) where he teaches a course on Liberation Technologies with J. Cohen. His books include Understanding Computers and Cognition (Addison-Wesley, 1986) and Bringing Design to Software (Addison-Wesley, 1993). 49Erik Olin Wright is Vilas Distinguished Professor of Sociology at the University of Wisconsin (Madison), where he has taught since 1976, and president of the American Sociological Association (2011-2012). His research has mainly focused on the reconstruction of the Marxist tradition of social theory and research, especially the analysis of class. Since the early 1990s he has directed the Real Utopias Project. His principal books, most of which published by Verso, include Class, Crisis and the State (1978), Classes (1985), Reconstructing Marxism (1992, with E. Sober and A. Levine,), Interrogating Inequality (Cambridge U.P., 1994), Class Counts (1997), Envisioning Real Utopias (2010), and American Society: how it really works (2011, Norton, with J. Rogers). 50Almaz Zelleke is a political scientist and Associate Dean for Academic Affairs at The New School for General Studies (New York). Her articles have been published in Policy & Politics, Rev. of Social Economy, J. of Socio-Economics, and Basic Income Studies. She is a member of the Executive Committee of the Basic Income Earth Network (BIEN) and of the Coordinating Committee of the U.S. Basic Income Guarantee network (USBIG). 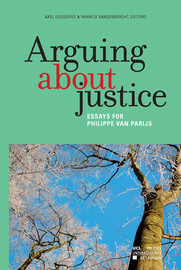 On the contributors and editors In : Arguing about justice : Essays for Philippe Van Parijs [en ligne]. Louvain-la-Neuve : Presses universitaires de Louvain, 2011 (généré le 21 avril 2019). Disponible sur Internet : <http://books.openedition.org/pucl/1763>. ISBN : 9782875581969. Gosseries, Axel, et Philippe Vanderborght, (dir..) “On the contributors and editors”. Louvain-la-Neuve : Presses universitaires de Louvain, 2011. (pp. 9-20) Web. <http://books.openedition.org/pucl/1763>.